The bone is an item dropped by the skeleton. Two to three bones are dropped by the bone block when mined. Skeletons drop 0-2 bones upon death. 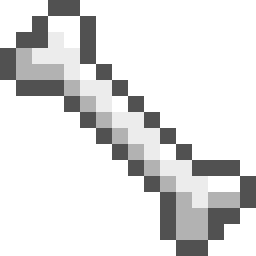 A bone can be used to craft three pieces of bone meal. Four bones can be used to craft a bone block. Five bones can be used to craft eight bone shurikens. Bones can be used to tame wolves by shift-clicking onto them, but it will take more than one bone to tame the wolf. This page was last edited on 5 July 2018, at 12:46.